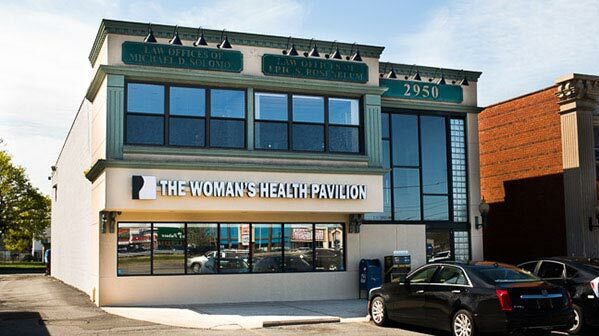 At The Woman’s Health Pavilion, our team of OB-GYN specialists welcomes women from Bellmore, New York, to our nearby Levittown location. We provide comprehensive care for our patients, whether they require services in obstetrics or gynecology, and whether their needs are urgent or routine. With an in-house lab, pathologist, and high-resolution 4-D ultrasound machine on-site, The Woman’s Health Pavilion offers complete care under one roof. To meet with a Long Island gynecologist or other experienced practitioner in Levittown, request an appointment using our online form or by calling (516) 731-9000. We offer same or next-day appointments for urgent conditions. There is plenty of free parking available both in the parking lot right outside our office and in the municipal parking lot behind CVS. Our Levittown location is located within a 10-minute drive of Bellmore. You will find this office at 2950 Hempstead Turnpike, one-quarter mile east of the Wantagh Parkway, between Dunkin Donuts and CVS. Our experienced practitioners will make you feel right at home. We provide maternity care from routine to high-risk, and we offer a complete range of gynecologic services including minimally invasive gynecologic surgery. Travel northbound on the Wantagh State Parkway. Take exit W3 West onto to Hempstead Turnpike (Route 24) westbound. On Hempstead Turnpike, you will pass Starbucks and Subway on the left, and the Dalton Funeral Home on the right. At Levittown Veteran’s Memorial Park, exit to the right into the Hempstead Turnpike service lane. To access our parking lot, turn at the Dunkin Donuts sign. Our office at the end of the shopping plaza, between Dunkin Donuts and CVS. We are directly across Hempstead Turnpike from P.C. Richards.